This was Tuesday, November 18th. It took the better part of the day for us to make the drive from Gulf Shores, Alabama to Panama City, Florida but the weather improved as the sun warmed us as we drove along Highway 98 through all the tiny beach towns from Pensacola. Early afternoon, we reached Tyndall Air Force Base and the Famcamp park where Tom had secured a two night reservation for us in the gravel overflow lot just inside the complex. DJ and an AVA walking friend she met the summer before, named Diane, waited for us right on the side of the highway. It was great to see DJ's smiling face. Turned out Diane is a full-time RV'er too. She's retired from one of the railroad companies, sold her home in Texas and travels in her Honda Pilot, pulling her 17' Casita camper. DJ asked if we'd impart some of our travel thoughts with Diane as she too planned to get into South Florida for winter. Of course we did. DJ prepared shrimp linguine and we visited her home for the first time, to eat that night. Oh and DJ is a good cook! 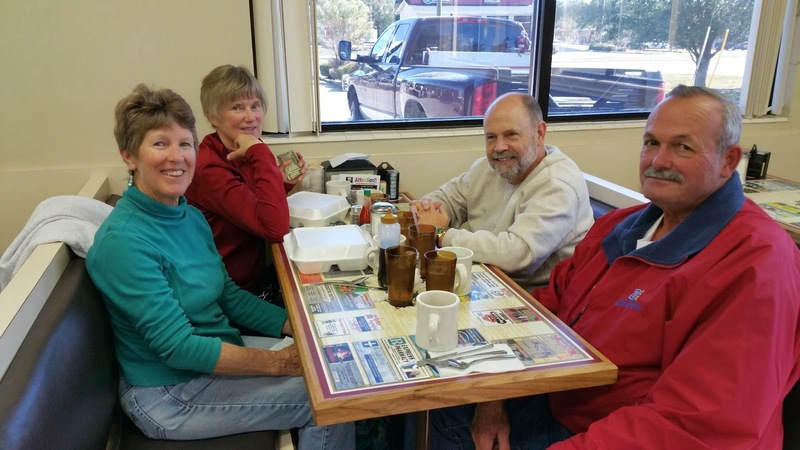 Next morning we converged at a quaint little home town eatery for breakfast and talked more about upcoming travel, Diane's trip to south Florida and the purchase of a new rig for Tom and DJ as we are looking forward to travel with them again soon. DJ, Diane, Wayne and Tom. The second day was spent around Tyndall and Tom got Wayne in for a close look at some of the newest flying machines which was a super thrill for him. We girls shopped the post exchange and planned another seafood dinner. This time, DJ fried grouper she had nabbed herself while scuba diving. Oh it was heaven. She also prepared a luscious key lime pie. After dinner the five of us returned to the Famcamp where we sat around the campfire that was conveniently located inside a plastic covered gazebo. DJ discovered an apple drink that we warmed and sipped. Good thing we had hot drinks, the nighttime temperature dropped to 29 degrees. I thought I would surely freeze to death. Our visit was short but sweet and we pulled out of Tyndall's Famcamp the next morning headed south with a vengeance.